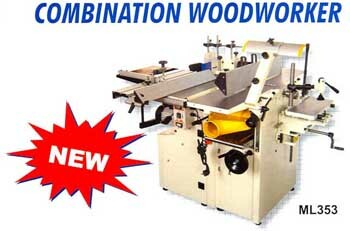 A combination woodworker is exactly what is says it is ,a combination of planer /thicknesser ,sawbench,spindle moulder and mortiser ,all in one compact and multifuction unit. The machine tables are all made of cast iron for strength on a steel fabricated base unit.The fences are made of extruded aluminum and are fully adjusted .The machine has dust extraction hoods or outlets on each function each of which has a 100mm outlet adn requires a dust colletor.The machine has a weight of some 235kgs,which achives much stable performance. The machine has two independent motors ,each one dedicated to one of the above functions and controlled by use of switch console,and a number of switches situated around the machine closed by each working station. 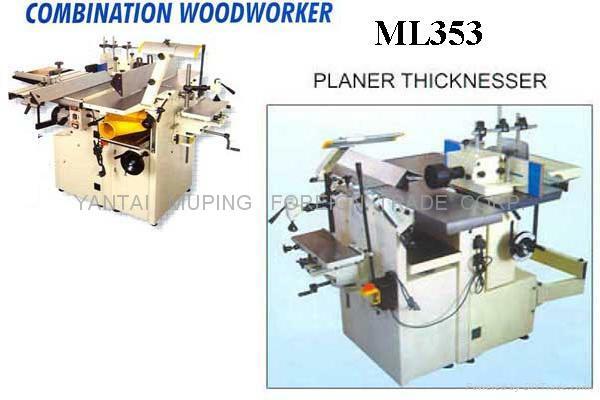 The planer has a 250mm wide bed adn can be used to straighten timber and plane it with two saquare edges prior to thicknessing.The cutter block has a speed of 4000 rpm and it is fitted with three re-sharpen -able knives giving a very clean finish.For chamfers the planer fence can be angled over to a maximum of 45 degrees .Whilst surfacing or planning the dust hood sits beneath the machine,collecting the chips (and should be used with a suitable dust collector).To undertake thicknessing the tables are raised and the hood relocated allowing timber up to 250x180mm in size to be accurately dimensioned .The timber is fed by feed rollers at a fixed speed of 8 meters per minute. The saw will accept a 200mm diameter blade the machine is supplied with a rip blade .There are many different types of applications that should be considered before fitting the blade .These are ripping ,cross-cutting and fine cutting of man made materials such as MDF. The machine has a 30mm spindle which has a single speed of 7600rpm.Again ,because there are so many different types of cutter block ,the machine is not supplied with a cutter block.Fitted to the machine is a fully adjustable guard,which has an independently adjustable fence.One top of the guard are hole down adn hold in sprung guards that keep the material firmly against the table and moulder fences .The recess in the table is called the well and will accept tooling up to 140mm in diameter. 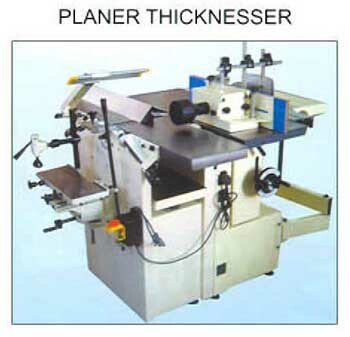 felles planers,, trearbeid powermatic rigid moulder kald transportabel planer, tre planer, planer tavle, dewalt sander, tykkelse planer, router planer, bryllup planer, delta planer, kraft elektrisk bryllup planer boaa kombinasjon woodworker er nøyaktig hva er sier det er, en kombinasjon av planer/thicknesser, sawbench, spindel moulder og mortiser, all i en pakt og multifuction enhet.den bearbeidende tabeller er all laget av støpejern for styrke på en stål fabrikkert basis Justert. maskinen har støv extraction hetter eller utløp på hver funksjon hver av som har en 100 mm utløp adn krever en støv colletor.den maskin har en vekt av en achives meget stabil prestasjon. Maskinen har to uavhengig motorer, hver en spesiallaget til en av den ovenfor funksjoner og styrt ved bruk av bryterkonsoll, og en antall brytere lokalisert omkring maskinen tett ved hver arbeidsplass. Planer/Thicknesser han planer har en 250 mm vid seng adn brukt rette ut tømmer og plan det med to saquare kanter før thicknessing.den skjærerblokk har en fart av 4000 med tre ang.-sliper -kyndig kniver gi en meget ren avslutning.for chamfers planer gjerde vinklet over til en maksimumsverdi på 45 grader. Whilst dukke opp eller å planlegging støvhetten sitter under maskinen, samle flisene (og bruker med en passende støvsamler). foreta thicknessing tabellene hever og omplassert hetten tillate tømmer opp til 250x180mm i størrelse nøyaktig dimensjonert Ved mater valser på en fast fart av 8 målere pr. minutt. Den så aksepterer en 200 mm diameterblad maskinen forsyner med en riftblad. det er mange forskjellig typer anvendelser som betrakter før passe bladet. Disse river, kors-skjære og bøtelegger skjære av mann laget stoff slik som MDF.